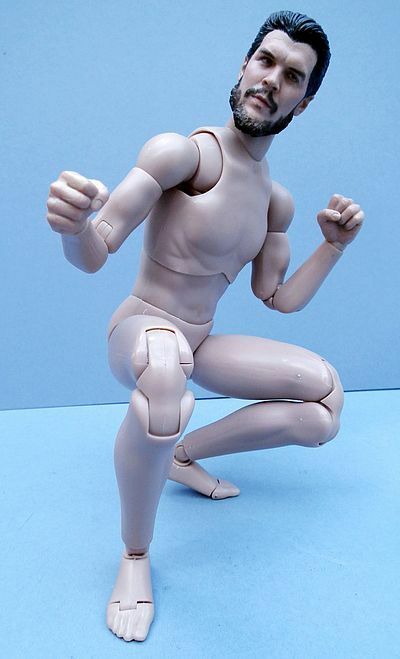 Jeff checks in tonight with a look at the new body from Enterbay - along with some discussion on just who that 'generic' head sculpt looks like. Take it away, Jeff! 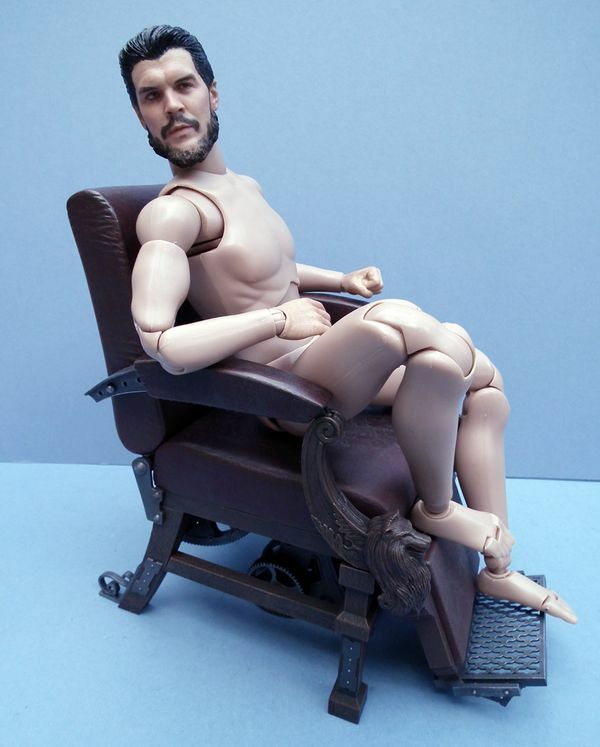 When it comes to the very pinnacle of high end 1/6th, especially in the arena of licensed movie, comic and game related figures, Hot Toys have reigned supreme for the past five or six years with few detractors. There are other companies emerging that are certainly pretenders to the thrown, but the main competition in terms of quality during that time has come from Enterbay. They started out focusing primarily on their much coveted Bruce Lee license, working closely with his estate and showcasing the talents of master sculptor Arnie Kim. And as time goes on they are announcing more interesting licences, with an eye on the more leftfield ‘cult’ subject matter, and of course remaining loyal to Asian Kung Fu action movies. They also recently announced that they would be venturing into fully articulated ¼ scale figures, kicking off with a great representation of Arnie as the T-800 from Terminator 2, can’t wait to see how he turns out. But right now I’m looking at their new base 1/6th figure which goes by the name of the Real Masterpiece 4. This is the second version, hence its designation RM4- 02. 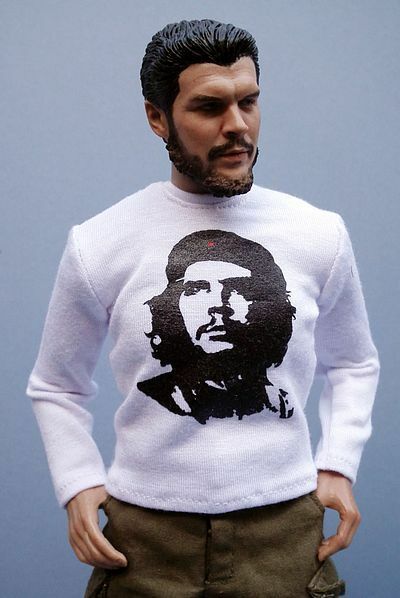 The first one had more than a touch of the ‘Matt Damon’s’ about it , but this one has a heavy hint of a certain Argentinean Marxist revolutionary… But just how much? This is just a simple plastic container, designed to show off the contents and hold it secure whilst it in transit. It’s a no frills affair, but robust enough to protect the figure well. The whole container is made of thick transparent acetate with black and white printing. It is minimalist and tasteful, but not exactly the stuff that makes you weak at the knees. Inside the figure is held in a vac-formed tray and is completely collector friendly. 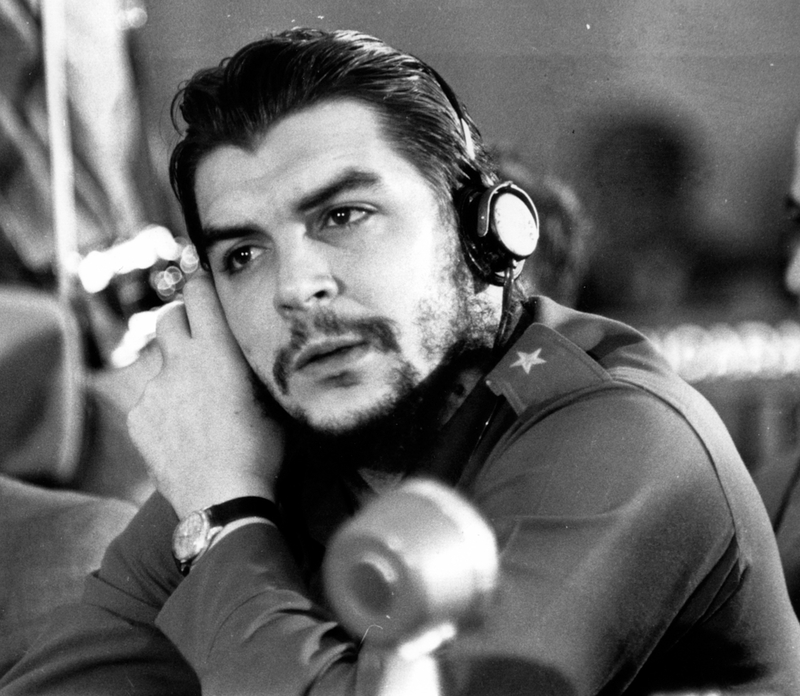 Now if you know anything about Ernesto Guevara, and have seen photos of the man (like this and indeed this), you will know just how very strong this portrait is. I even think it has the edge over the Dragon in Dreams one that came out a few years ago. I also have the old Medicom BAPE figure that must be about ten years old now, it came with a ‘Planet of the Apes’ Che head and a straight Che head, needless to say this one is again stronger than that earlier incarnation. The expression is relatively neutral, but still serious enough to suit a great many poses. 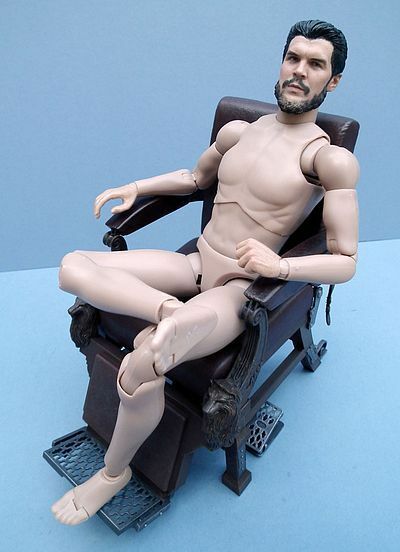 The detailing on the skin texture is deftly handled as is the fine work on the hair and beard. This is not credited to a named sculptor on the box, but after asking the powers that be at Enterbay I was informed that it’s by their resident master sculptor YJ Park and his team, and he’s done a fantastic job. I recently mentioned Enterbay in a review when comparing the quality of various companies paint apps. In it I said that when firing on all cylinders Enterbay were up there with the best, and here they are certainly pulling no punches. The skin tones are all very realistic with subtle and naturalistic spotting. 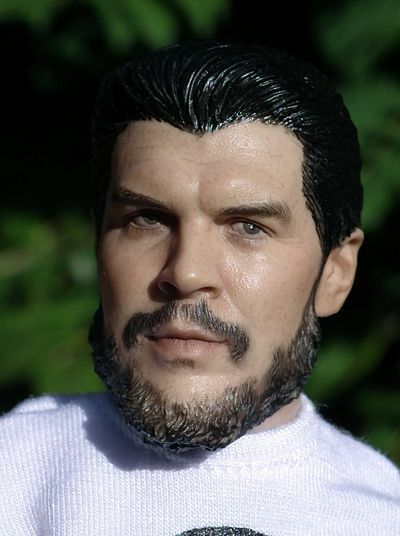 The hair is painted in accurately with no slop and the work on the beard and tash is worthy of special note because of the super subtle feathering where it graduates into the skin. The eyes look wet and glossy and are looking off slightly to the left (and lets face it, this guy certainly favoured the left). I would have preferred the eyes to have been looking straight ahead on this occasion, but the quality of the actual application is not in question. The paint app like the sculpting was overseen by YJ Park again, obviously a very talented multitasker as this is definitely a four star job! 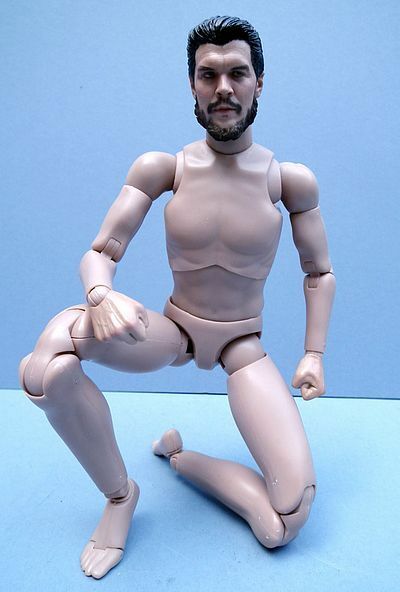 At last we have the Enterbay body we have been waiting for. This can actually be considered an equal to the True Type which has held a dominant position for many years now. It’s still not 100% perfect, but let’s face it there isn’t a base body available yet that is. However if you approach this with realistic expectations, much like you would the TT, then you will be pretty happy. 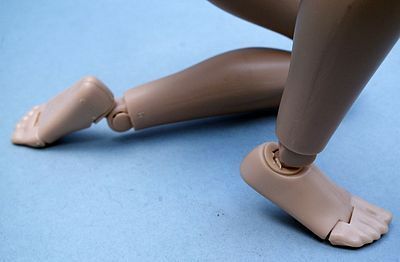 So, from the ground up we get a pinned joint at the mid point of the foot, then a universal joint at the ankle that can both point and rock a little from side to side and with careful manipulation you can get them into pretty much any angle you need. 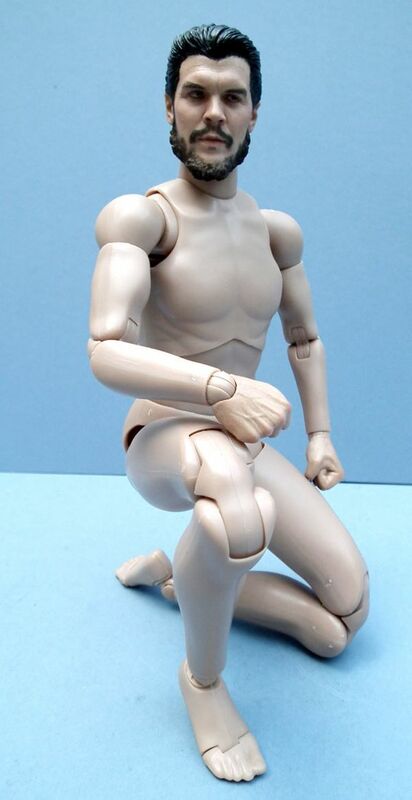 The knees have a double joint so can bend right back to a kneeling position and next up are double pinned universal ball joints at the hips. The groin area is joined to the abdomen with a free moving and rotating joint, as is the abdomen to the chest, there is only a limited amount of movement here, but it helps greatly in getting more subtle and natural poses. 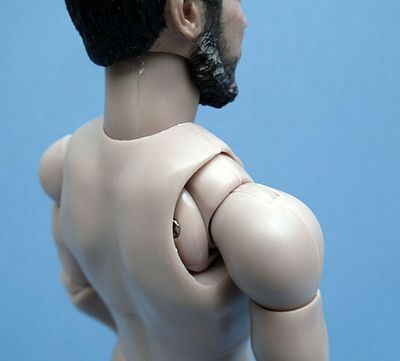 The shoulders have a fully functioning universal joint that can turn forward and back and also shrug up and down. 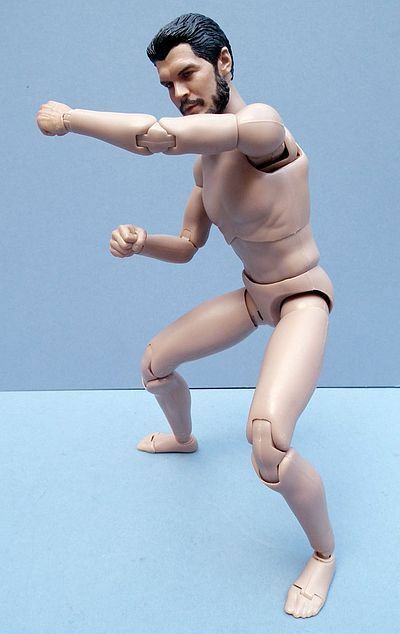 The arm itself can rotate a full 180 degrees and the bicep joins the upper arm with a disguised cut/peg joint. Next is a double elbow which leads onto the classic double pegged cut ball joint. Lastly there is the neck, it is jointed both where it joins the head and at the base of the neck. The range here is fair, but had the hole the neck fits into been just a smidgen bigger we would have got an even better range of motion, making it able to tilt from side to side and also look up and down more acutely. However that is a little fine tuning that I’m sure will be revisited with future incarnations of this body, but even as it is I’m impressed enough to give this a full score. So, a relatively simple and compact selection that would have benefited greatly from a black beret, though as a top tip the Barney Ross beret does actually fit pretty well and I used it in a few of my pics. I also used a green military shirt and gun belt that I had in my spare bits and pieces box to show how he looks if you decide to go for a more authentic look. All the garments are well tailored with good seams and no loose threads at all, and the trousers have working patch pockets on the thigh, cut pockets at the hip and draw-strings at the ankle. The white T-shirt bares the classic stencil style image that has adorned a million student’s shirts, badges and posters for the last 40 years. Based on the classic photo taken by Alberto Korda it is now ‘officially’ recognised as the most famous photo in the world, based on the findings of the Maryland Institute College of Art and the V&A Museum in London. It’s an image that has come to symbolise revolution and people power the world over, and could still be seen held high during the Arab Spring uprising earlier this year. Of course it’s a bone of contention as to how worthy the man actually was to hold the lofty position of global icon for freedom, but regardless of your politics, you can’t deny the beauty and power of the image. 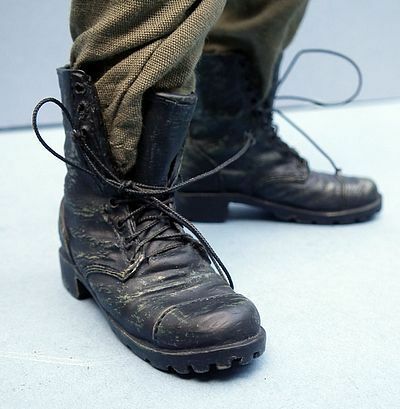 Lastly he comes with some lace up combat boots. I warn you now that these are a tight fit… no, a VERY tight fit. To get them on I actually dropped them one at a time in some boiling water, then while still soft and pliable I quickly pulled them on over the feet and to remove them I did the same thing in reverse. As I said above the outfit is available separately from the Enterbay site at a price of $37, which again includes the world wide mailing. 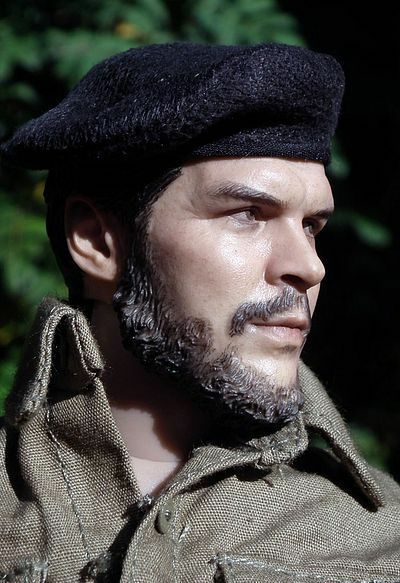 I have to admit the price is a little high for this set, and had it included a military style jacket or shirt, along with the iconic beret it would have seemed a far better deal, but it’s still a great set (with more than a slight hint of irony) to display him in. Well, you get some extra hands, but that’s it. It’s a base figure, so as such it could be said that ‘fun’ is a bit of a moot point. However, just like many other manufacturers they go the extra mile with the inclusion of a celebrity ‘looky-likey’ head sculpt. Dependant on your ‘politics’ this particular ‘celebrity’ may be pretty divisive, but threes no denying it’s a strong sculpt, and it comes on a body that is up there with the best! This is available direct from the Enterbay site for $52, which is hardly the sale of the century, but that price does include shipping to wherever you happen to be on the planet. I do tend to think of most classic ‘high end’ base bodies being about $40 to $45, but I guess that having world wide shipping included counts as quite a bonus, especially if you happen to be on the other side of the planet. If you decide to get this from OSB they are selling it as a set with the outfit included for £58.50. I’m hugely impressed; this really is the base body I have waited for from Enterbay. This will allow their new 1/6th figures to shine much more brightly, as not only does it have far better range of articulation than any of their former bodies but it also hangs and poses in a much more natural way too. Being a Brit I based my score on getting this from Onesixthbruce where he can be picked up as a set with the outfit at the price listed above. Now I just need to see if I can hold of their Leon figure and put it through its paces, it looks pretty good! 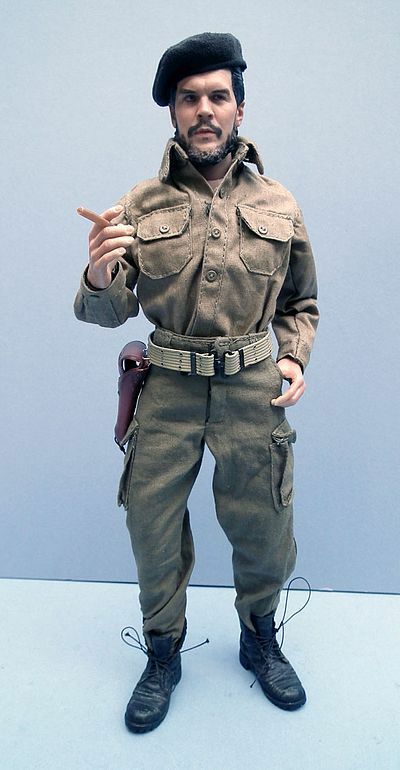 There are a few options on where to pick this up, but the most obvious is direct from the Enterbay Website, just go to collections and choose the miscellaneous option where you’ll find this figure and the outfit set available. They also still have the other clothing set on offer that goes with the first release of this base figure. You know, the one that had a slightly more than passing resemblance to Matt Damon as Jason Bourne. 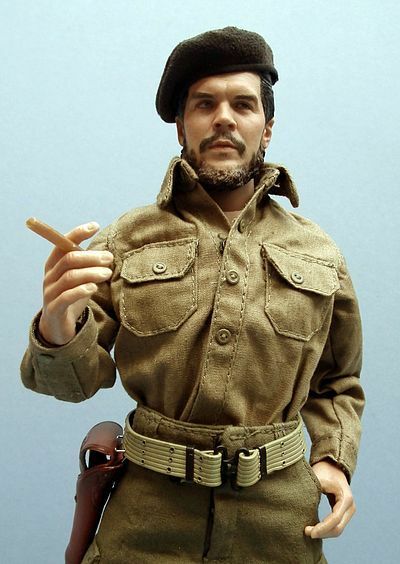 If you are in the UK or Europe you can’t go wrong with a trip to onesixthbruce.co.uk where as I said above the full set can be bought for a very reasonable £58.99 (not often you get a hi-end figure of this quality for that price). I didn’t find it with any of the sites sponsors, but eBay also has the base figure (no outfit) for around $60.